If you had a live Christmas tree this year and now wonder what to do with it: recycle it (how? where?) or if not, dispose of it (how, how much?) then this page should help you. 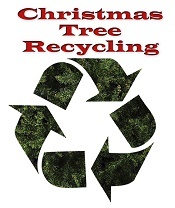 Many cities and counties have recycling services to put your old Christmas tree to new life as a wildlife sanctuary, on a sand dune to protect the beach, chipped for mulch or as a bird feeder. Look below on this page for both general tips and options specific to your local area. One tip: some areas are now calling a Christmas tree a "Holiday tree". Ugh! What Are Your Recycling Choices? Curbside pick-up for recycling - Most areas will collect trees during their regular pickup schedules on the 2 weeks following Christmas. For curbside collection, there are often requirements for size, removing ornaments, flocking, etc; see below for where and how to recycle your tree most easily, in your local area. They'll turn it into mulch, which may be free for you to pick up, if you want it! Non-profits that pick up - Cll for an appointment to have a non-profit in your area pickup your tree. Some boy scout troops are offering a pickup service for a small donation (often $5). Drop it off - Take your tree to a drop off recycling center. Home Depot is collecting Christmas trees in many areas, free of charge. Most counties have free drop-off locations throughout the county. Usually, you may take up to two trees to any of the following drop-off locations at no charge. Yard waste pickup - Cut the tree to fit loosely into your yard waste container. Recycle it yourself - see farther down this page . Unless otherwise noted, all stands, lights, decorations, and tinsel must be removed. Artificial Christmas trees can not be recycled. They must go out with the garbage. Remove all ornaments, tinsel, lights, and other NON-Organic decorative materials. This includes tree stands also. Trees are often required to be cut into 4 ft lengths; so you may need to cut your tree in half. In some locales, the trees must be cut small enough pieces to fit inside your green (yard waste) container. Flocked trees will often need to be chopped-up and disposed with regular solid waste. Not all areas will take flocked trees. Each area has different requirements, so be sure to check with your hauler's website (see below). Trees are usually collected curbside for two weeks after Christmas, sometimes the whole month of January. If you miss the collection period, you can cut-up the tree and place it in your green (yard waste) container for pick-up on the regularly scheduled service day; assuming your area has a yard waste collection program to which you subscribe. 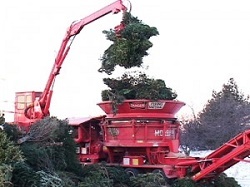 Click on the links below to find your local Christmas tree recycling options . Specific local information is given below, where available. If no local information is provided, and you wish to add it, please use the feedback form ! If your local hauler is AW / BFI (Allied Waste) - Click here to locate the contact information for your local hauler. Soil erosion barriers: Some communities use Christmas trees to make effective sand and soil erosion barriers, especially at for lake and river shoreline stabilization and river delta sedimentation management (Louisiana does both). Fish feeders: Sunk into private fish ponds trees make excellent refuge, breeding area and feeding area for fish. Bird feeders: Place the Christmas tree in the garden or backyard and use it as a bird feeder and sanctuary. Fresh orange slices or strung popcorn will attract the birds and they can sit in the branches for shelter. (Make sure all decorations, hooks, garland and tinsel strands are removed). Eventually (within a year) the branches will become brittle and you can break the tree apart by hand or chip it in a chipper. See this article from Perdue University for more information . Mulch: A Christmas tree is biodegradable; its branches may be removed, chipped, and used as mulch in the garden. If you have a neighbor with a chipper, see if he will chip it for you. Be sure to apply garden lime on the mulc to counter the acidity. Paths for Hiking Trails - some counties use the shredded trees as a free, renewable and natural path material that fits both the environment and the needs of hikers! Living, rooted trees: Of course, next year, you could get a rooted (ball and burlapped or containerized) tree and then plant it in your yard after Christmas (It's a good idea to pre-dig the hole in the late Fall while the soil is still soft, then plant the tree into that hole immediately after Christmas.) NOTE: Living trees have a better survival rate in mild climates, than in a northern area. Important: Never burn your Christmas tree in a fireplace or wood stove. Pines, firs and other evergreens have a high content of flammable turpentine oils. Burning the tree may contribute to creosote buildup and risk a chimney fire.